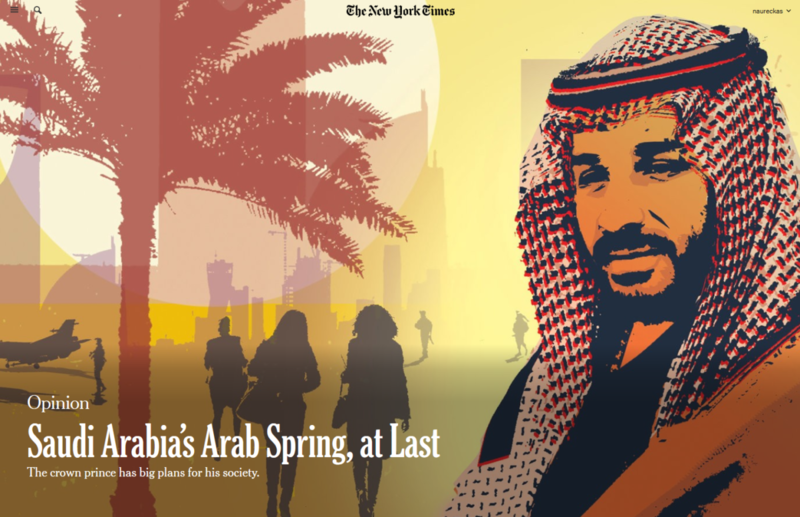 Until now, CBS News and the New York Times have boosted Mohammed bin Salman's image. What took so long? During his U.S. PR tour in March, Saudi prince and de facto ruler of the absolute monarchy Mohammed bin Salman (often referred to as “MBS”) touted the progress the kingdom was making in the area of “women’s rights” — namely, letting women drive and combatting nebulous reactionary forces that were somehow separate from the regime. Since then, at least seven major women’s rights advocates — Eman al-Nafjan, Loujain al-Hathloul, Aziz al-Yousef, Aisha al-Manea, Madiha Al-Ajroush, Walaa Al-Shubbar and Hasah Al-Sheikh — have been detained by Saudi authorities and, according to at least one report, may face the death penalty. Since the mass arrests of women’s group’s on Saturday, the Times news section has run several AP stories (5/18/18, 5/22/18) on the crackdown and one original report, but it took more than a week for typically scoldy editorial board to issue a condemnation of the arrests. They did, however, find time to condemn in maximalist terms the “violent regime” of Venezuela, insisting on “getting rid” of recently re-elected president Nicolás Maduro, and ran a separate editorial cartoon showing Maduro declaring victory over the corpses of suffering Venezuelans. Nor did MBS’s biggest court stenographer, Thomas Friedman, find room in his column last week to note the crackdown. Given that Times opinion page editor James Bennet has clearly stated his paper is axiomatically “pro-capitalism,” one wonders whether he views Latin American socialists as uniquely worthy of condemnation, whereas Middle East petrol dictatorships that invest in American corporations and host glossy tech conferences deserve nuance and mild “reform” chiding. We have to “get rid of” the former, and the latter simply need “guidance” from the U.S. — their respective human rights records a total non-factor. CBS ran a 50-second story on the “emancipating” MBS’s crackdown on its web-only news network, CBSN, and an AP story on its website, but CBS News has thus far aired nothing on the flagrant human rights violation on any of the news programs on its actual network, and certainly nothing in the ballpark of its most-watched prime time program, "60 Minutes." If influential outlets like the Times opinion section and CBS News are going to help build up bin Salman’s image as a “reformer” and a champion of women’s rights, don’t they have a unique obligation to inform their readers and viewers when the image they built up is so severely undermined? Shouldn’t Thomas Friedman, who did so much to lend legitimacy to the Saudi ruler’s PR strategy, be particularly outraged when he does a 180 and starts arresting prominent women’s rights advocates? Will "60 Minutes" do a comparable 27-minute segment detailing these arrests and their chilling effect on activism? Who's your favorite woman in history? SalonTV's recent guests weigh in on the pioneering women we should never forget.